This is a report on the state of Fibre and 4G deployment in Riyadh based on data points collected by Speedchecker in September 2018. The report discusses the state of Fibre and Mobile coverage (the extent of coverage and the quality of service) and the Speedchecker Measurement Method. The conclusion shows how Riyadh is placed to take advantage of future improvements to networks. 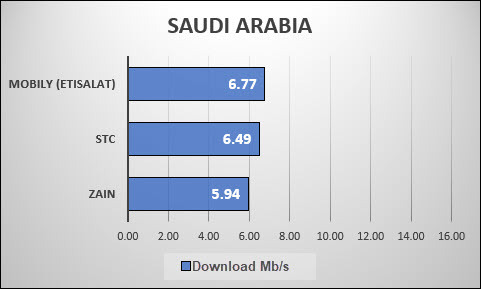 The three main Internet providers in Riyadh are STC, Mobily and Zain. Only STC provide services over 4G, Fibre AND Copper. Mobily offer 4G and Fibre and Zain provide 4G but not Fibre or Copper. Riyadh has excellent 4G coverage and Fibre is well established in the centre of the city and plans are well underway to extend the coverage to the main city areas. Fibre beyond the main city areas is planned but not currently in progress. Fibre is widely available across Riyadh particularly in and close to the centre. The map shown below shows that coverage is poor in the South-West of the city and in the rural areas surrounding the city. Fibre is provided by STC and Mobily with Mobily exclusively covering the South-West and ITC the North-East. Other existing areas are covered jointly by STC and Mobily. The In Progress areas (yellow on the map) are either STC or ITC with some coverage being provided by Dawiyat. Zain has no fibre coverage in Riyadh as at October 2018. Riyadh has excellent 4G coverage with 4G being available in all urban districts and along the length of the main roads going into and out of the city. Speedchecker uses the billions of data points collected through its passive and active measurement technologies worldwide to provide insights to our customers. This is used by businesses to improve their service and by research establishments to provide invaluable information. Each data point consists of many KPIs including speed, latency, location, connection type, device info. Our results focus on speed and latency as experienced on the device to provide insightful information on Quality of Service. More detail about the Speedchecker Measurement Method. 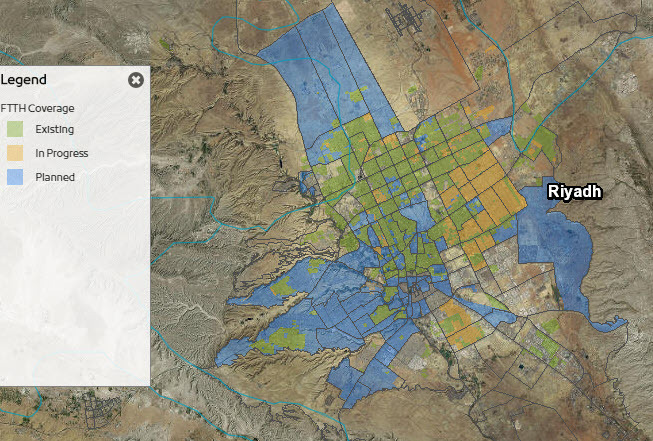 This data is then integrated into our customizable map-based dashboards for geospatial analysis. Riyadh has an ongoing plan to implement fibre broadband across the city. Our results clearly show a correlation between the speeds achieved in districts that have fibre and those that do not. 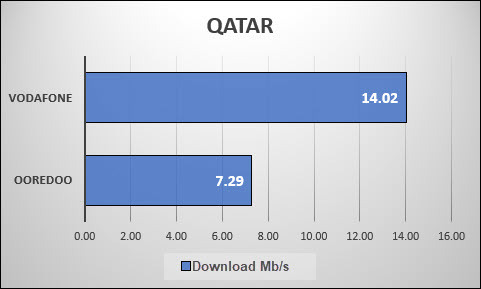 We analysed the fibre results from STC to see if they correlated with the rollout of fibre across Riyadh. Our results on the left show high-speed results in Red / dark orange and slower results in yellow / light orange. 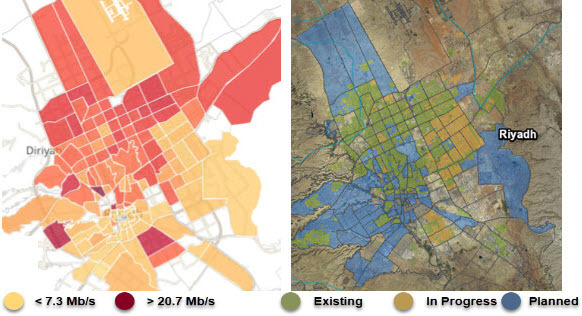 These can be compared with the green areas from the MICT rollout plan where fibre is already available and the yellow areas where it is in process. The blue areas show areas that are planned but not yet in process and it is in these areas that the speeds are low. 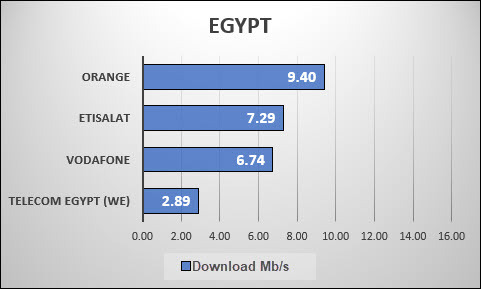 We are still analysing the results from Mobily fibre and will publish when the analysis is complete. 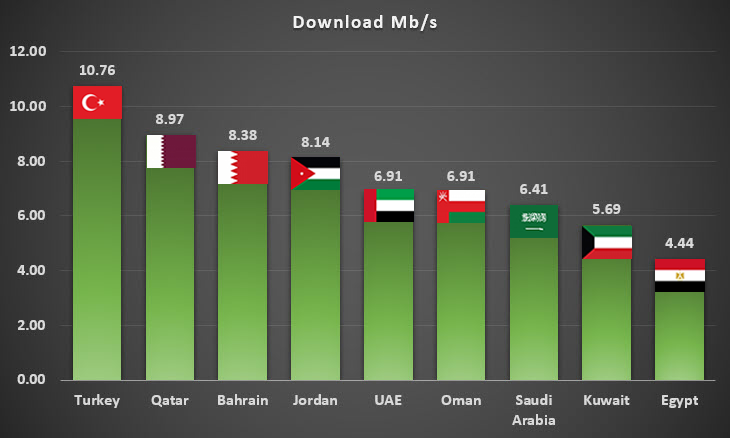 Speed result data points collected from Riyadh in September 2018 were analysed and allowed the top 3 mobile providers to be compared. By adding the download speed data to our districts map of Riyadh we can clearly see that STC provided the fastest download speeds followed by Mobily and finally Zain. The maps also show a consistent difference in speeds from district to district. Districts that are the fastest or slowest for one provider tend to be the fastest or slowest for the others even though their actual speeds may vary. 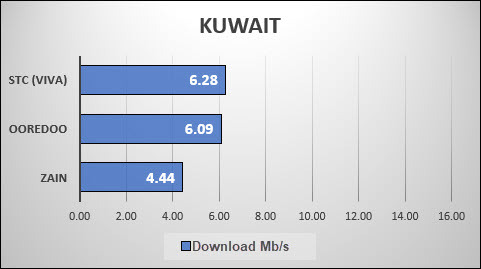 The following table illustrates the fastest and slowest districts in Riyadh based on the average mobile download speeds. The speeds highlighted in green represent the 5 fastest speeds by provider and the red speeds are the 5 slowest by provider. It is clear from this table and the maps above that STC are getting the fastest mobile speed test results and Zain the slowest. Riyadh has excellent 4G coverage provided by STC, Mobily, Zain and other mobile operators. The MCIT (Ministry of Communications and Information Technology) plan for rolling out fibre across Riyadh is well-established and their progress map is accurate. All 3 companies are providing a good service with STC having more coverage and faster speeds. Our report has highlighted some areas of Riyadh that could need some improvement in service and others that are doing very well. This may inform future plans for infrastructure changes. This is a good foundation that should ensure Riyadh will be well-placed to continue to take advantage of improvements in technology such as 5G. This will ensure that businesses and residential users can continue to enjoy all the benefits that these advances bring. Interested in more detailed information on the Internet quality and coverage in Middle East and beyond? CDW 2015: The evolution of content delivery architectures and workflows, and their role in distributing content throughout the globe. 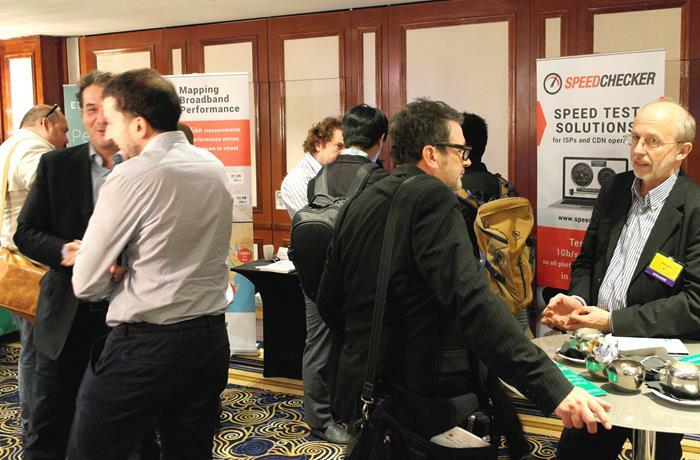 In October 2015 Speedchecker hosted a stand at the Content Delivery World Conference 2015. Featuring influential speakers from Canal+, Time Warner Cable, Wuaki.tv, Sky, Telecom Italia, BT, Telefonica, Cisco, Freeview and others. 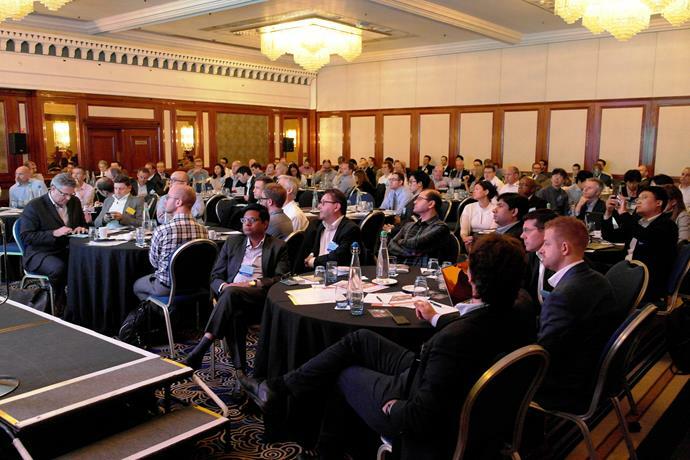 This is a summary of the event from Steve Gledhill (Head of Content, Speedchecker Ltd) with focus on how to improve the Quality of Service for the end user. 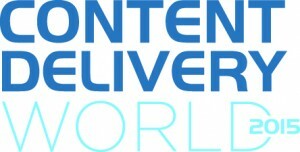 Content Delivery World 2015 brought together players from across the content delivery ecosystem, enabling the exchange of ideas and innovations and formation of partnerships that will fuel the growth of the content delivery industry, furthering the potential of this multi-billion dollar market. Of particular interest was how to measure the Quality of Experience for the end user rather than only the Quality of Service of the suppliers (CDNs, ISPs and Media Providers). Most of the information that we see regarding the performance of Content Delivery focus on latency, bitrate, throughput and other important factors that relate to the efficient data transmission. We were keen to learn from the key players at the conference how they translate these cold figures into a meaningful Quality of Experience. It was heartening to see that QoE was covered in most of the presentations indicating that this is seen as a key factor in improving the industry moving forward. With regards to QoE it was agreed that “quick enough is good enough”; black screens are unacceptable; less than 2 seconds to switch channels is OK.
VTT in Finland have used user panels to discover how much (or how little) latency and buffering will cause their viewers’ QoE to become unacceptable. Time Warner reported that they have seen a steady 20% annual increase in the growth of IP traffic year on year and they note that 78% of this is video. In order to cope with this steady increase they see a need for TCP Tuning, OS Tuning, NIC Tuning and a general reduction in the protocol overheads. They see the key metrics need to be captured passively and actively and include the monitoring of the system, analysis of logs and simulated clients. Alcatel made the point that the CDNs need to be more content aware than they are at the present to ensure the highest quality. They also recommend that each CDN end point should be aware of existing cache to prevent unnecessary delays. Another common discussion was around variable bit rate. For example, Sky Italia use Adaptive Encoding to ensure that users with 2.4 Mbps experience the same quality as those with 9 Mbs using near real-time encoding. This relies on a high quality original input. This bit rate is managed by the Sky CDN Selector at the Edge Server as close as possible to the consumer. Orange presented some interesting concerns around certain protocols. Their international CDN provides average speeds of 4Mbps but they feel they have a number of issues to contend with. First, they have issues with caching (many presenters referred to caching as being a key area for improvement). Second, they highlighted the HTTPS issues for carriers under HTTP 2.0. Third, the need to be flexible and responsive to changes makes it hard to provide consistently high quality. Finally, they made reference to the Microsoft Smooth Streaming minimum latency requirement being too high to provide live content as they would wish to. Problems with multicasting: Requires Unicast Tunnelling across Gaps where Multicast is not possible; Speeds can fall to slowest bit rate; Unicasting is recommended in the home/office. Aventeq predict that by 2020 the average smartphone contract will allow 5Gb of data to be downloaded each month. This confirms that we need to ensure that the user experience for the mobile user is given high priority when considering QoE. This emphasis was highlighted by EE when they showcased their 4G video offering showing seamless streaming from dense urban areas, to high speed (legal) motorway driving and in to the countryside and forests of England. They say this is possible because of the UK having an average speed over LTE of 20Mbps – the fastest in the World. EE also took a different approach to improving QoE by not just dealing with latency and speed but with the actual content. They propose giving audiences to live events the option to see a choice of angles and bespoke statistics. This is available in the home but they propose making this available on mobile devices. A number of Media providers are using or developing their own CDN (Content Delivery Network) to ensure that they are in control of the users’ QoE. Canal+ in France have 20-25 Free To Air channels and other services that will be transmitted via their own CDN in the next 12 months. Most of their traffic is driven by Live (premium) content and it is important for Canal+ that they maintain a high QoS for this content. They report that their users complain about streaming that doesn’t launch; video quality issues and buffering in roughly equal measure. 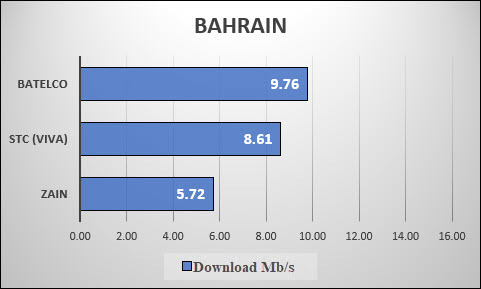 Their research shows that download speeds of between 2 and 2.5Mbps are acceptable for the QoE of the end user. These speeds are achieved at all times except for the peak times of 7pm and later when problems start. Canal+ plan to provide their content directly to the ISPs instead of using a CDN as is currently the case. This should save money but they also hope that it will improve users’ QoE. Most of the discussions and presentations dealt with moving the data around as efficiently as possible with no concern with regard to Net Neutrality. That’s not to say that this is ignored but rather, I suggest, that it is acknowledged that best technical practice needs to be modified to comply with regulations in any and all countries. For that matter, DRM and other copyright issues were only touched upon in a few presentations for similar reasons: the focus of the conference was on efficiency and how the technology can be used and improved upon.